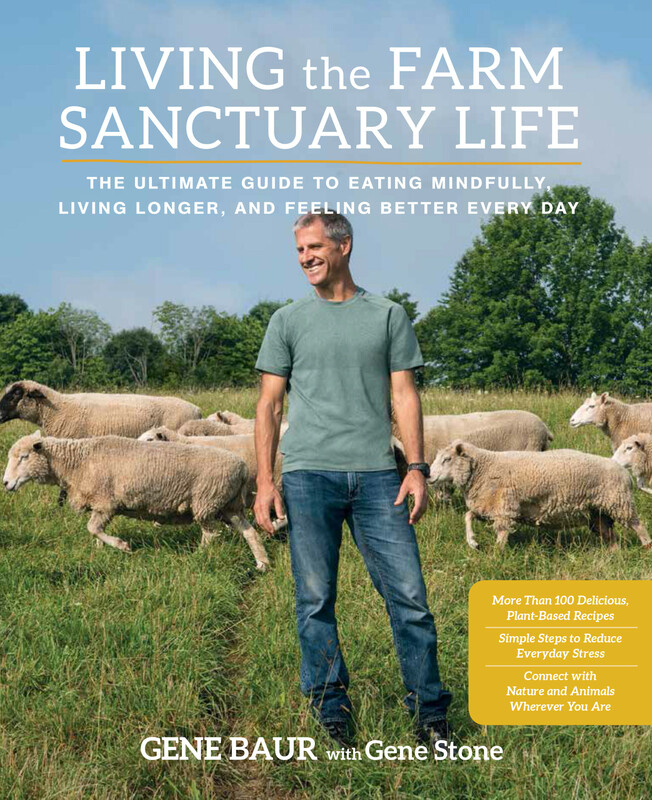 Farm Sanctuary President Gene Baur has come a long way from his early days selling veggie dogs outside Grateful Dead concerts to fund farm animal rescues. For the past 25 years, Baur has traveled across North America campaigning to raise awareness about horrors of the factory farming system – and the dangers inherent in our cheap food system. Heralded as the “the conscience of the food movement” by Time Magazine, the best-selling author, who just released ‘Living the Farm Sanctuary Life,’ is recognized as one of the most influential social justice activists of the 21st century for his work to change the way society views and treats farm animals. A pioneer in the field of undercover farm investigations, Baur has visited hundreds of stockyards and slaughterhouses to document the deplorable conditions, in a bid to help consumers understand where their food really comes from. He now serves as the president of largest farm protection organization, with shelters in New York and California that provide rescue, refuge and adoption for hundreds of animals each year. Hot on the heels of his appearance on the “The Daily Show with Jon Stewart,” and ahead of his August 8 appearance at the Sunshine Coast VegFest, the longtime animal advocate chatted with us about the misconceptions about the Canadian food system — and the simple changes you can make to your diet to live a conscious, cruelty-free life. Many people in Canada think factory farming is much worse in the U.S., but that’s not necessarily true. Factory farming has become the norm in Canada, just like in the U.S. It is common for farm animals in both countries to be crowded into warehouses, and packed into cages and crates so tightly that they can’t move. In both Canada and the U.S., farm animals are treated like commodities, rather than as living, feeling creatures. Do you think Canadians are kept in the dark when it comes to how the meat they buy in the grocery store ends up there? Yes. Like people in other developed countries, Canadians are disconnected from the source of their food, and unwittingly support a horrific factory farming industry when they consume meat, milk and eggs. Most Canadians, like people around the globe, are appalled to learn about the intolerable abuses that have become commonplace on today’s farms, so agribusiness has a strong desire to keep consumers in the dark. In your new book you advocate for a plant-based or vegan diet to achieve optimal health and happiness: Why? A whole foods, plant-based diet supports both physical and psychological health. It could reduce health care costs by 70 per cent and lower our risks for leading killers like heart disease and cancer. Eating plants instead of animals lessens the amount of violence in the world, and better aligns with our humanity, so we can avoid the emotional dissonance that comes from killing animals for food. Most people want to be humane, but the words “humane” and “slaughter” don’t fit well together. What about for those people who don’t want to adopt that plant-based eating philosophy? Are there steps meat-eaters can take to make more conscious decisions about the food they buy? People who are eating meat can take positive steps by eating less meat, by participating in programs like Meatless Monday, and by substituting plant protein, like beans and tofu, in place of animal protein. Unfortunately, labels on meat, milk and eggs suggesting that farm animals are treated humanely usually sound better than they are and mislead consumers. The only way to actually know how farm animals are treated is to visit farms and see first-hand how they are raised and killed. At your farm sanctuaries, people and animals interact as friends and companions – even playmates. How does this change people’s perceptions about animals that they would normally eat? Like cats and dogs, farm animals are individuals, each with a unique personality. They develop relationships and form strong emotional bonds with other animals and people. At Farm Sanctuary, people have a chance to interact with turkeys, cows, chickens, pigs and other farm animals, and to relate to them as friends, instead of as food. It is a lot harder to eat animals when you get to know them as living, feeling individuals. You say some people who visit your farms and meet the animals burst into tears and have highly emotionally-charged experiences. Why? Factory farming and slaughter is an affront to our humanity, but most of us grow up eating animals without really thinking about it. When people visit Farm Sanctuary and meet rescued farm animals, they come face to face with refugees of this abusive system, and it can bring out strong emotions. People sometimes feel intense guilt for their contributions to intolerable suffering, or they might feel elation at being released from the internal conflict that exists when a person’s behavior is not aligned with their values. Some people feel an enormous sense of relief to meet animals whose lives have been spared, or feel inspired to be at a sanctuary where their feelings are validated, or are given hope for a better future. How can changing the way you eat change your life, and make you live longer? Our food choices have profound impacts on our personal health and well-being. Food can be our medicine, or our poison. We can choose whole plant foods that nourish our bodies and enable us to thrive, instead of processed animal products that contribute to life threatening diseases. Besides improving our physical health, eating plants aligns with our values and interests and empowers us to live without causing unnecessary animal suffering or the ecological harms inherent in animal agriculture. Baur is speaking at the upcoming Sunshine Coast VegFest on August 8. He’s also taking part in the Vancouver Walk for Farm Animals on September 26. The walk raises vital funds for Farm Sanctuary’s work and brings together thousands of people to change hearts and minds about farm animals. 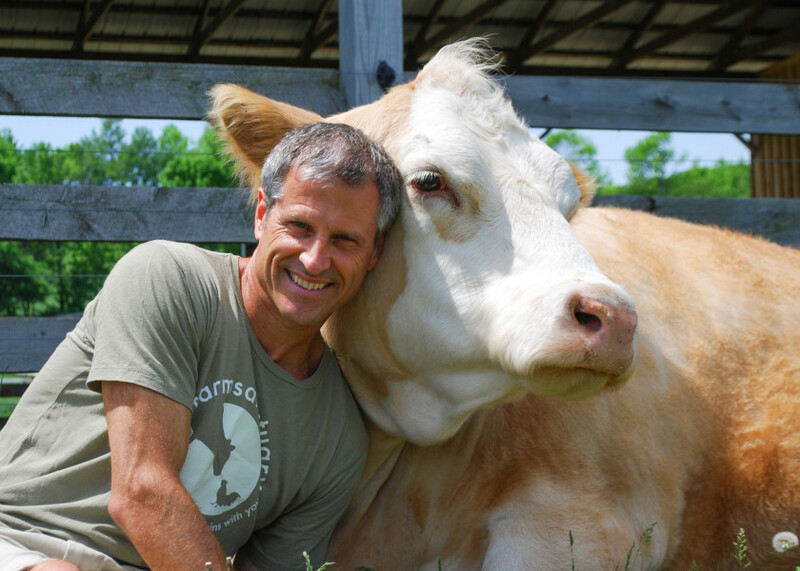 Gene and a Farm Sanctuary resident (Farm Sanctuary).